Here in America there are two main camps when it comes to politics. One group works on emotion and what feels good and won’t let reality or facts get in their way. The other group works on facts and past results and knows that reality isn’t always pretty. I spent most of my life in the first group until I got older and like many men started to pay more attention to politics in my thirties. I slowly realized that the liberal world view is based on an immature fantasy/conspiracy mindset. It’s a hard transition from one group to the other. You have to realize and admit that most of what you held to be fact was propaganda and talking points designed to keep people like me that were too lazy to research reality happy in our little liberal perception bubble of holier than thou victimization. Many people never grow out of this perception bubble, content to view anything other than their narrow view of the world with hate and disdain. These are the people that are the most fun to fire up so they start preaching. I have had several liberal friends and family attempt to talk sense into me after reading some of my rants and I’m more than happy to sit and listen. You can’t inject fact into the debates because that is viewed as cheating when debating liberal views. Liberals have a universal “get outta reality free card” when shown proof they are wrong. I love how when faced with indisputable evidence, libs will universally resort to repeating “I don’t believe it!”. They then become defensive and always say the magic words, “where did you get that? Fox News?“. At that point they refuse to debate the subject anymore declaring themselves to be on higher moral ground. Just prime the pump and watch them go…. The fire in their eyes as they preach the inherent evil in all but the extreme liberal views of the world is an entertainingly scary sight. Truly concerned liberals trying to enlightening and convert people in hopes of exorcizing the evil FOX News demons from inside their heads are no less starry eyed then the Evangelical teenage boys wearing suits on bicycles trying to convert the world door to door with a bible in their hands. Most of these examples have been repeated to me by several people and are echoes of wacko talk show host’s talking points on Air America that I have heard. I am not singling out anyone for ridicule. Here are some of the “facts” I have been given by well meaning friends and family. are not allowed to see taken from farther back in the room that proves he never raised his voice during that speech and was just gently clearing his throat...I have reviewed the video, I think he may have raised his voice a little bit. Not to mention he was holding his OWN mic! One of the most wide spread liberal truths that I have had repeated by friends and family alike is that Bush has secretly and systematically changed the laws and has completely dismantled the constitution in his plan to conquer the world. To this I reply that this is awful! The African Americans must be devastated now that slavery is legal again with the US since the 13th amendment of the constitution would be included in that plan. Also included in that theory would be all the other Amendments and building blocks of freedom we enjoy in America. The whole plot revolves around the perceived need to assassinate Bush before November because it is a known fact that he is going to cancel the elections and declare himself a dictator over the United States for life. There are apparently no longer any laws to stop him from doing so!! There are many books written on the pending Republican coup and the libs believe it with all their cute well meaning little hearts. One of my liberal friends that used to be one my main sources of political news before I woke up and learned to accept reality can preach this sort of rhetoric for days on end. His Liberal bias and world conspiracy mindset has grown over the years. He pays for satellite TV because he can’t trust American broadcasting. Other than the History and science channels he will only watch a station out of France for his news because it is a liberal anti-American station so he trusts it. He is very upset that the mass media in this country is all owned by right wing Nazi bastards. He maintains that all the TV networks are controlled by Bush. He views CNN as the worst of the right wing propaganda spewers. Through him I have learned that CNN has never once said anything unfavorable about Bush or the Republican party. CNN and the rest of the mainstream media hate Democrats and is run right out of the basement of the White House. CNN, NBC, CBC and ABC all work for Bush and are forced to have Bush personally review and censor everything before it can be aired. When we go buy steaks for dinner we have to drive way into the next county to go to a “safe” grocery store because all the closer ones had at least one employee that “looks” like they might be a republican so he is afraid to buy food there for fear they will find out he is a democrat. He is convinced they will poison his food or report him to the Bush administration. He has an open tooth that was drilled out during a root canal at his dentist’s office. He has used this dentist all his life but over heard a dental assistant make a pro war comment in a conversation and made them stop drilling, he jumped out of the chair and ran for his life because he won’t have a republican work on his teeth. He now can’t find a liberal only office to trust with his dental needs so he is forced to live in pain by the evil republicans. He is scared of the Bush death squads that are out going door to door hunting liberals. When they find a Democrat, the whole family is drug out into the street where they are tortured and executed on the spot in broad daylight in front of the neighbors and left laying in the street dead as a warning to others that disagree with Bush. I can’t use his name (I wouldn’t anyway) or even allude to having a liberal friend because Bush’s team monitors the internet and will find out. The death squad will then hunt me down at President Bush’s orders. They will torture me until I tell them where he lives so they can find and kill him. And he believes every bit of it. The scariest part of his delusion is that I have been told similar death squad stories by three different people over the last few years. I have learned from other libs that there is a study out that proves that watching FOX News and the Rush Limbaugh TV show causes actual physical brain damage!!! …. I don’t have the heart to tell these people that Rush Limbaugh doesn’t even have a TV show. I have learned that before Bush, the rich paid most of the taxes in the US. Now under Bush’s tax cuts, Corporations such as Ford and GM don’t pay even a penny of tax on any of their operations yet still qualify for a tax return worth millions of dollars. The Bush plan forces the poor to pay over 90% of the income taxes collected and the rich pay none. Most of the tax revenue collected from the poor is then given directly to the rich in the form of gifts. I’ve learned that the ANWR oil drilling plan is just a cover up for Bush’s plan to clear cut every single tree in Alaska and that all the oil under Alaska is minimal and would be pumped out in less than 6 months. Bush plans to have removed every tree standing in Alaska by then in the name of clearing an area in ANWR’s “pristine forest” for the drilling operation….which is one of the biggest Liberal lies told! 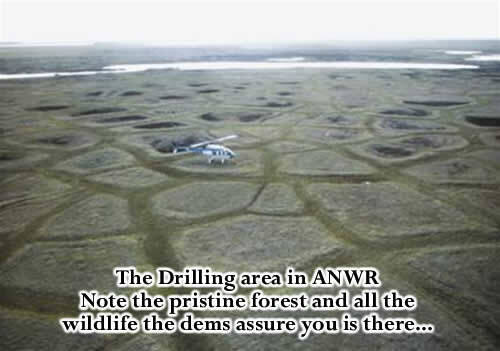 There is no vegetation or wildlife in the ANWR drilling area! The list of psychotic and down right laughable things told to wake me up and show the follies of my and every non-lib’s views for my own good keeps growing as I remember more while typing. I left the “feelings out weigh facts” agenda years ago and even though I have been the subject of several interventions meant to save me I refuse to turn back. Next time you're at a liberal friends house and the conversation slows down, just mention you saw something on Fox and watch the eyes roll and the fun begin! Be comfortable that you have no chance of having your views considered. Liberal’s view points are as self serving as a newly born-again Christian’s and their whole purpose in life is anchored in their willingness to blindly believe. Have some fun and debate away, Just remember to be a good friend and politely concede rather than insult a libs whole bases of reality. They take this stuff personal, hehe.